Stem Cells for Joint Therapy, Safer than Knee Surgery? Stem Cell Therapy for joint pain, inflammation, injury, and repair has been involved in multiple clinical trials worldwide. In the United States trials for knee arthritis and back pain with degenerative disc disease have undergone safety trials and phase studies for effectiveness. The safety profile for stem cell therapy in joints has been proven. Adverse effects are not seen as related to the stem cells. These studies were conducted with Allogenic (other people’s) stem cells. Naturally if using your own stem cells, which is permitted in the United States for join therapy, the issues which may be raised from someone else’s stem cells is not a concern, and are therefore even safer. There are no immune rejection issues or communicable diseases that can be obtained by using your own cells. Stem Cell Therapy for joints also do not carry surgical risks such as anesthesia, their is no greater risk for other postoperative complications such as, blood clots, infections, or need for revision surgery if it is unsuccessful. Surgery for joint replacement does carry risks some are significant as this is a highly invasive surgery. 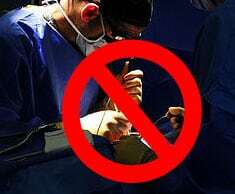 Joint replacement surgery consent forms do include the complication of death. Though rare, it has occurred. Stem Cell Therapy for joints is no more difficult than injecting cortisone into the knee. There is preparation involved to get to that point, however the actual placement of the stem cells into a joint like the knee, is the same difficulty and minimal risk of adverse events just like getting a cortisone injection into the knee. Stem Cell Therapy for joint repair has been used for acute and chronic injuries, knee meniscal tears, loss of knee joint cartilage, and to stop the progression of degenerative arthritis. This latter effect is becoming a more common alternative to joint replacement. Stem Cell Therapy is a frequently requested alternative to knee joint replacement. Some patients may have already had one knee joint replaced with a bad outcome and wish to avoid a second knee replacement. Others may not be healthy enough with additional medical disorders that they cannot have the knee replacement and therefore the regenerative procedure is an attractive conservative option in these cases. Patients who are not medically suited for joint or knee replacement are generally good candidates for Stem Cell Therapy. The pursuit of conservative options in patients who wish to avoid surgery for joint disorders, may find Stem Cell Therapy as an attractive alternative.